What an un-moving opening ceremony and I know 3D animation enough to know that opener with the CGI is pretty atrocious. I compared it to our opening ceremony four years ago and made mention to Tyler how much culture NZ has compared to England. What could they have done other than fly Harry Potter through on a broom stick? Cut off someone's head for good measure? For a minute I thought they may have impressed me by turning the giant football into a tardis, but instead it became central for a human pyramid that reaches the Webb Ellis cup retrieved by none other than faux William Webb Ellis. First game: Fiji vs England. Bad taste England during the Fijian Cibi. I swore my way through the chorus of "Swing low". 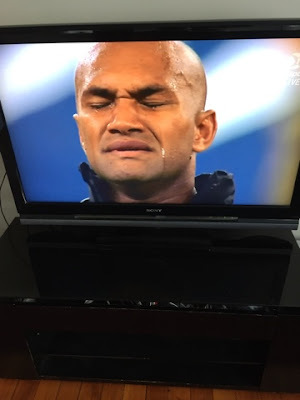 Nandolo during the Fijian national anthem.